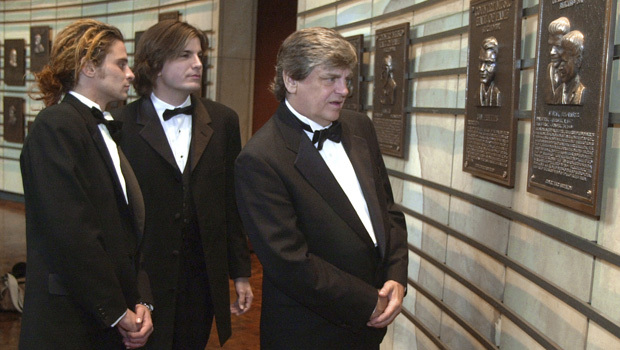 LOS ANGELES - Phil Everly, who with his brother Don formed an influential harmony duo that touched the hearts and sparked the imaginations of rock 'n' roll singers for decades, including the Beatles and Bob Dylan, died Friday. He was 74. Phil and Don Everly helped draw the blueprint of rock 'n' roll in the late 1950s and 1960s with a high harmony that captured the yearning and angst of a nation of teenage baby boomers looking for a way to express themselves beyond the simple platitudes of the pop music of the day. The Beatles, early in their career, once referred to themselves as "the English Everly Brothers." And Bob Dylan once said, "We owe these guys everything. They started it all." The Everlys' hit records included the then-titillating "Wake Up Little Susie" and the universally identifiable "Bye Bye Love," each featuring their twined voices with lyrics that mirrored the fatalism of country music and a rocking backbeat that more upbeat pop. These sounds and ideas would be warped by their devotees into a new kind of music that would ricochet around the world. In all, their career spanned five decades, although they performed separately from 1973 to 1983. In their heyday between 1957 and 1962, they had 19 top 40 hits. In a statement, Don Everly said that he and his wife, Adela, were touched by all of the tributes to his brother. "I was listening to one of my favorite songs that Phil wrote and had an extreme emotional moment just before I got the news of his passing," Don Everly said. "I took that as a special spiritual message from Phil saying good-bye. Our love was and will always be deeper than any earthly differences we might have had." They were inducted into the Rock 'n' Roll Hall of Fame in 1986, the same year they had a hit pop-country record, "Born Yesterday." Don Everly was born in 1937 in Brownie, Kentucky, to Ike and Margaret Everly, who were folk and country music singers. Phil Everly was born to the couple on Jan. 19, 1939, in Chicago where the Everlys moved to from Brownie when Ike grew tired of working in the coal mines. The brothers began singing country music in 1945 on their family's radio show in Shenandoah, Iowa. Their career breakthrough came when they moved to Nashville in the mid-1950s and signed a recording contract with New York-based Cadence Records. During their breakup, they pursued solo singing careers with little fanfare. Phil also appeared in the Clint Eastwood movie "Every Which Way but Loose." Don made a couple of records with friends in Nashville, performed in local nightclubs and played guitar and sang background vocals on recording sessions. Don Everly said in a 1986 Associated Press interview that the two were successful because "we never followed trends. We did what we liked and followed our instincts. Rock 'n' roll did survive, and we were right about that. Country did survive, and we were right about that. You can mix the two but people said we couldn't." In 1988, the brothers began hosting an annual homecoming benefit concert in Central City, Kentucky, to raise money for the area.